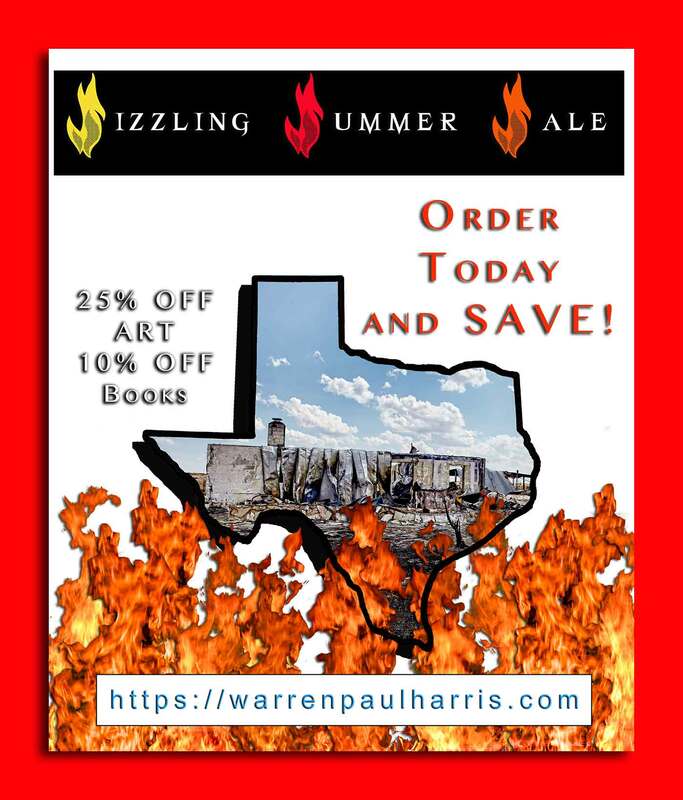 warrenharris.net > Art Shows > Sizzling Summer Art Sale! We are all suffering through a harsh Texas summer (big surprise…) so to celebrate living in Hell’s suburb, we are having a SALE. Here’s an opportunity you don’t see every day. In fact, this is the first time we have EVER had a sale on books. Everything on our e-commerce site is ON SALE through August. This is a great opportunity to pick up some copies of Texas As I See It for holiday gift giving and at a bargain price. Don’t expect to see this again anytime soon. This is also an excellent time to pick up some art at a huge discount. Go to our e-commerce site to order art or books. If you are interested in quantity purchases, email or call to arrange pickup and save big on shipping. Texas As I See It has it’s own YouTube Channel, of course, and this week we’ve been very busy creating and uploading new promotional videos. Please subscribe to our channel, as the more subscribers we have, the more features it unlocks. Also, please, LIKE, comment and SHARE our videos. This helps us get the word out. The newest videos feature me paging through the book. to a beautiful steel guitar sound track by Marty Muse of Austin, Texas. This is the 60 second hyperlapsed version – you Have to see this.